Holy Week begins with Palm Sunday (when Jesus made his final entrance into Jerusalem) and culminates with Easter Sunday. As Holy Week progresses to its final days, the solemnity heightens. Sundown on Holy Thursday to sundown on Easter Sunday is considered the most solemn part of the liturgical year. This three-day period is referred to as the Easter Triduum. The Easter Triduum is one great festival recounting the last three days of Jesus&apos; life on earth, the events of his Passion and Resurrection, when the Lamb of God laid down his life in atonement for our sins. The Men&apos;s Group Lenten Fish Fry will take place each Friday during Lent. Plates are $10 with a choice of croaker, whiting or shrimp, slaw, beans and hush puppies. Serving 11AM - 7PM in the PLC. All proceeds benefit the work of the OLC Men&apos;s Group. Rice Bowl - A Faith Formation family project CRS (Catholic Relief Services) Rice Bowl is a faith-in-action program that invites us to encounter and support the needs of others. We pledge to stand alongside these members of our human family. Please consider these suggestions in your family’s Lenten plan: Use your Lenten Calendar daily to guide your prayer, fasting and almsgiving. • Read the Stories of Hope and daily reflections to inspire your Lenten journey-and guide your Lenten almsgiving. Prepare simple, meatless meals on the Fridays of Lent to eat in solidarity with our brothers and sisters around the world. Visit crsricebowl.org to watch videos of the people and communities you support through your Lenten gifts to CRS Rice Bowl. Please see any Faith Formation student or catechist during Lent to donate to this worthy cause. Together, we can make a difference! The Lenten tradition of praying the Stations of the Cross at OLC will begin on Friday, March 8, 2019 at 7PM in the Church. The 14 stations commemorate Jesus&apos;s last day on Earth as a man. The stations are a mini pilgrimage along the way of the cross as the individual moves from station to station. Stations will be lead by Fr Basile and all are encouraged to attend each Friday of Lent. The Parish is invited to come to the First Annual Christmas Nativity Pageant presented by Faith Formation students in the Parish Life Center on Sunday, December 16, 2018 at 3PM. There will be a Parish Christmas Party following the Children&apos;s Christmas Pageant. All are invited to attend. The Girl Scout Troop 464, Boy Scout Troop 172, and Youth In Action are collecting items for gift bags to be given to children staying at the Center of Hope Women&apos;s shelter this holiday season. The goal is to pack and give 100 gift bags. Your donations of large gift bags, toys, games, toothbrushes, wash cloths, feminine hygiene products, socks, hats, gloves, scarves, etc. can be placed in the box available in the vestibule. Monetary donations are also welcome and will be used to purchase items for this project. Please drop off all items in the box by Tuesday, December 18th. Thank you for sharing your blessings with these children. Christmas Mass will be celebrated at OLC on Christmas Eve, Monday, December 24th at 8:00 p.m. and on Christmas Day, Tuesday, December 25th at 10:00 a.m. The Black Culture Commission and OLC welcomed nationally renowned facilitators, Sr. Patricia Chappell and Sr. Anne-Louise Nadeau of Pax Christi, USA. Sr. Chappell and Sr. Nadeau conducted a workshop and engaged an open discussion on racism, white privilege and actions that can be taken to heal the racial divide in our parishes, dioceses and community. The two day workshop brought together both white and people of color across the diocese and in our community to address this sensitive but much needed discussion. With the Catholic Social Teachings as our foundation, the facilitators led the attendees through discussions on the difficulty of talking about racism to action plans to take away for continued discussions and solutions. This blessed day of fellowship, conversation and enlightenment was a much needed continuation on the conversation on social justice in the Diocese of Charlotte. Click here for pictures and additional information on the workshop. The Feast of All Saints on Thursday, November 1st is a Holy Day of Obligation for all Catholics, meaning we are to attend Mass. Mass will be November 1st at 8:30 AM and 7 PM. The Parish Office will be closed in observance of the Holy Day. Mass celebrating the feast of All Souls will be Friday, November 2, 2018 at 8:30 AM. Can you imagine having no safe place to call home? No comfortable place to retreat to at the end of the day. It doesn’t matter if that place is one of opulence or simple necessities…it only matters that the space is YOURS! This experience is either non-existent or fleeting for many of our neighbors. Far too many people work everyday in Charlotte – sometimes two or three jobs – and cannot afford to live here! Further, some of these individuals are the heroes that teach our children, care for the elderly, work as tellers at our local bank branch or provide basic but necessary services to all of us – everyday! They are our neighbors and behind too many of their smiles lies the shame or fear of impending homelessness. The truth is, Charlotte does not have adequate affordable housing units to meet the housing needs of many poor families. Charlotte’s Housing Neighborhood Services Department recently reported that in spite of Charlotte’s tremendous growth and prosperity, “…The need for more housing options spans households at many income levels, including a total deficit of nearly 24,000 units for households at and below 50 percent of area median income, and one in three households still pay more than one-third of their income on housing each month. I hope you will consider “the least of these” that Jesus spoke of and vote your conscience regarding the $50,000,000 Affordable Housing Referendum Bond! The Ladies Auxiliary of the Knights of St. John will be hosting a fund raising Fish Fry on Saturday, October 6th from 11:30AM - 8:00PM. Fish dinners are $10 and include fish, dry rice or fried plantains, kala, or hushpuppies. Side orders of coleslaw and beans are also available. Please plan to join us! Fr. Basile Sede will speak at St. Peter&apos;s Catholic Church on Sunday, October 7th after the 9:00 AM Masses. St. Peter&apos;s parish community invites the members of Our Lady of Consolation to attend. The event will take place in Biss Hall, directly below the church. Our Lady of Consolation OLC Walks team participated in the 40th annual Charlotte Crop Walk for hunger on Saturday, October 13th at Independence Park. It&apos;s not too late to support our team by making by making a donation at crophungerwalk.org/charlottenc/OLCWalks. Most Reverend Bishop Immanuel Bushu from the Diocese of Buea, Cameroon, who is celebrating 40 years as a Priest and 25 years as a Bishop celebrated Mass with our Pastor Rev. Basile Sede at OLC on Saturday, July 29th. 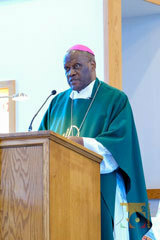 He is in Charlotte to raise support for the Catholic Univerisity Institute of Buea (CUIB). Click here for pictures provided by parishioner, Travis Burton (TO2 Photography LLC). There is also an article and video on the Catholic News Herald. The “Spiritual Intercessors” of OLC, led by Naomi Byrd, celebrated our own Deacon Todd on his 30th anniversary of his ordination to the diaconate and for his service to OLC and the Charlotte Diocese. Click here to view article in the Catholic News Herald. Pictures, taken by OLC parishioner, Travis Burton, can also be viewed and downloaded at TO2 Photography LLC.